The American Silver Eagle is one of the world’s most popular silver bullion coins. It consists of 1 troy ounce of silver, with a 99.9% purity guaranteed by the United States Government. This is the only silver bullion coin in the world with a silver content and weight guaranteed by the USA, making it a wise investment. Many collectors find the American Silver Eagle to be an affordable method of investing in precious metals. If you wish to purchase the Silver Eagle coin or would like to learn more about pricing, visit JMBullion.com who offer Silver Eagles from a variety of years and in varying degrees of condition. The American Silver Eagle coin was first introduced in 1986. Initially, the coin was minted in order to give American investors an alternative to foreign or privately-produced silver and gold bullion coins. In the initial years, inventories sold out nearly immediately due to the huge demand for the coin, both among coin collectors and among people looking to invest in the precious metal it contains. From 1986 to 1998, silver eagle coins were minted solely in San Francisco. In 1999 and 2000, the coins were produced in both West Point and in Philadelphia. Since 2001, all American Silver Eagle coins have been minted at West Point and San Francisco. In addition to the silver bullion coin, the U.S. Mint has also sold proof and uncirculated versions of this coin, produced specifically for coin collectors. Like the similar Platinum Eagle and Gold Eagle bullion coins, American Silver Eagles are not sold directly to the public by the U.S. Mint, with the exception of proof and uncirculated coins, which are available directly from the United States Mint. The distribution system for American bullion coins involves sending the coins to a network of authorized dealers such as coin retailers, banks, wholesalers, and precious metal companies. The coins are shipped to these resellers in “monster boxes,” each containing 500 coins. They are then sold individually or in 20-coin tubes to investors or collectors. Silver Eagle coins are technically legal tender, which means they could be used to purchase goods and services. They have a symbolic face value of one dollar. However, this face value is much lower than the value of the coin’s silver content. As a result, the current market value of the coin is based on the “spot price” of silver, plus a small premium to account for the desirability of this coin and its popularity among coin collectors. The price for current-year American Silver Eagle coins is typically around 10-20% higher than the current value of the silver it contains, with the proof and uncirculated versions commanding higher prices due to their popularity among collectors. The striking design of this coin is based on the famous “Walking Liberty” half-dollar, created by Adolph A. Weinman and minted from 1916 to 1947. Many coin collectors consider this to be one of the most beautiful coins ever produced. 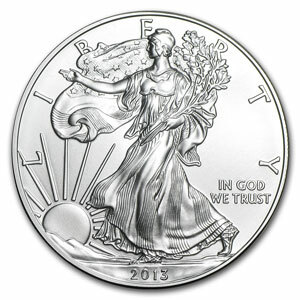 Now, the design has been revived, and is seen on the obverse of the American Eagle silver coin. The reverse depicts an eagle and shield design by John Mercanti, along with the words United States of America, 1 OZ. FINE SILVER – ONE DOLLAR, and E. Pluribus Unum. American Silver Eagle coins are the only legal tender pure silver coin issued by the United State Mint. As a result of its 99.9% purity, such coins are easier to convert to cash when compared with other silver coins, which contain lower amounts of silver. To date, more than 300 million American Silver Eagle coins have been produced. In 2011, more than 40 million were minted, an all-time high for this coin. Since its 1986 introduction, mintage numbers have varied widely, so the prices for these coins do vary by year. Founded in 2012, BuySilverCoins.com was built to be a go-to resource for silver coin investors, as well as a complimentary resource to the broad precious metals market. We primarily focus on bullion grade coins, but have plans to expand into numismatics in the future as well.